Good News on the Genetically Engineered Food front: Organic farmers from Oregon have brought suit against the government for approving RoundUp Ready sugar beets. A federal judge in San Francisco decided that the government failed to adequately evaluate the impact of “Roundup Ready” sugar beets on other, non GE crops and that an Environmental Impact Statement is required before planting of GE sugar beets can continue. So, we can all eat sugar again – at least for awhile. I am sure than Monsanto will try to fight this ruling with their bank of lawyers but the acknowledgement that we have a right not to eat this stuff is a great relief…That hasn’t been a prevalent opinion by the powers that control the food system and this ruling should help. Don’t forget to see Food, Inc. for a better look at Monsanto – the Darth Vader of the food system – or one of them. Meanwhile, what can I say? Your local farmers don’t use genetically engineered seed! Thanks for shopping local and good, clean and fair. At the Peppahead booth, it’s all about flavor and sensation. 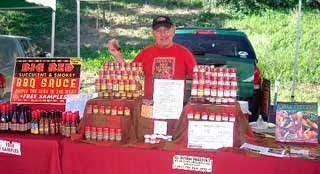 I wish to delight gourmet cooks and chile pepper fans with a very unique selection of chile powders, blends, and sauces (Mild to Hot) from Peppahead’s recipes. Please come by for a sample tasting. Great for gifts and stocking stuffers. 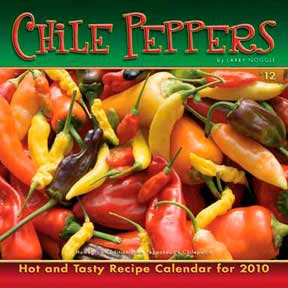 Now available, the 2010 “Chile Peppers” Calendar with photos of chiles from my garden, and tasty gourmet recipes. The perfect gift for gourmet cooks and chileheads. This calendar is the 12th edition and 2011 is now in the works. All grown, photographed, cooked, designed and produced by Peppahead. Peppahead’s Chile Patch, where chiles are selected for calendar photos. All are picked fresh from the patch and photographed on site with props and available light. We share and eat the rest of them. “I’m not fooling around here.” Stop and say howdy, ask chile questions and have a taste of the “Spice of Life”. Visit the Peppahead website for other products, informational links on chile topics and sources. Alma Rosa Chucherias and The Sebastopol Berry Farm organized a tomato tasting that was fun and tasty. There were great games for children and demonstrations for cooks of all ages. A big thank you to Alma and her wonderful workers for a great event. A special shout out to Gloria Vigil, Sebastopol Berry Farm and Alma’s sister for marketing the event. Santa Rosa’s Crescent Moon Farm owners are crazy for chiles By DIANE PETERSON THE PRESS DEMOCRAT Published: Monday, September 21, 2009 at 12:44 p.m. Last Modified: Monday, September 21, 2009 at 12:44 p.m. At the farmers markets in Santa Rosa and Sebastopol, Jill Adams and David Moring of Crescent Moon Farm are renowned for their tasty eggs, heirloom beans and brightly colored chiles, ranging from the Aji Amarillo peppers of Peru to the Shisito frying peppers of Japan. The self-confessed “chile heads” also sell the prized pimientos de padron, a small green pepper that’s fried, salted and served as a delicious tapas dish in Spain. “One out of 20 is supposed to be hot,” Moring said of the padron peppers. “So it’s chile pepper roulette.” While working a third of an acre behind their Rincon Valley home, plus a half-acre up the hill, the couple have jumped feet first into the farm roulette game, a risky business fraught with pesky pests, uncertain weather and low pay. Crescent Moon is at the Wednesday and Saturday Markets. Lazaro Calderon to prepare his special recipe for Pico de Gallo at the Annual Heirloom Tomato Tasting Festival on 9/26. The operators of the Patch know tomatoes. The Calderon’s operate the Patch in Sonoma. This year they planted over 30 thousand tomato plants. They expect to have tomatoes until Thanksgiving. If you are canning and need a quantity of tomatoes, give them a call, 939-8125. The Original Santa Rosa Farmers Market presents the Annual Heirloom Tomato Tasting Festival Saturday, Sept. 26 at the regular Santa Rosa Veterans Building East Parking, lot location. Tomato Tasting, Cooking Demos, Games for the Kids, My Favorite Tomato Tasting Contest, raffle prizes and more. 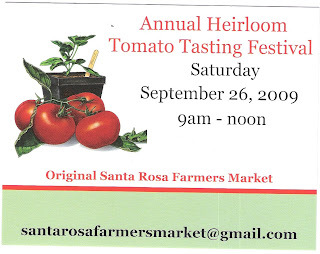 The Original Santa Rosa Farmers Market presents the Annual Heirloom Tomato Tasting Festival Saturday, Sept. 26 at the regular Santa Rosa Veterans Building East Parking lot location. Stop by for a fun filled family morning! At Orchard Farm the color is purple. Purple kohlrobi, purple potatoes, watermelon radishes and young Amaranth for use as a salad fixin’. All organic too! 1) Select your favorite recipe featuring tomatoes as the main ingredient. Your entry could be an appetizer, main dish or even a dessert. 3) Forms must be received by 8:30 am Saturday, September 26, 2009. 4) Prepare your entry prior to the beginning of the event and deliver by 8:30am to the Santa Rosa Farmers Market at the Veterans Building on Saturday, September 26 2009. 5) Please be sure to make enough for 6 people to sample. Entries will be judged by a guest panel. Our competition is open to all Sonoma County residents, both amateur and professional. Prepared entries must be delivered in person on the day of the festival. Prepare enough for 6 people to sample. As part of the entry form, include the recipe. The festival will be taking place at the regular farmers market location within the Veterans Building parking lot. Judging will be under a canopy. As you consider which recipe to enter, be aware no electricity or refrigeration is available onsite. First, second and third place prizes will be awarded at the event based on the decision of the judges. Prizes to be announced day of event. Judges will vote for My Favorite Tomato Recipe based on creative use of tomatoes, flavor and presentation. If you have questions please contact the Santa Rosa Farmers Market via email at santarosafarmersmarket@gmail. 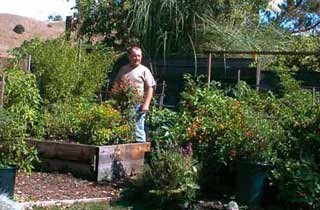 Nature’s Spirit offers certified organic plant starts. Chicory Almond, the grower, has a wide variety of vegetables and herbs perfect for fall planting. Glenn Griess has been a plantsman his whole life and brings to the Wednesday and Saturday Market an excellent array of vegetable and ornamental plants. Sonoma County’s milder winters make it possible to grow greens year round and Glenn has an excellent selection for planting now. The Saturday Market has all three plantsmen offering a wide variety of vegetable and ornamental starts. Next summer you can have huckleberry pie! Often confused with the blueberry due to its close resemblance, huckleberries are a wild blue-black berry. Although very similar in taste, the big difference is the seeds within the huckleberry that give it a crunchy texture when fresh and its thicker skin. The flavor is a little more tart than blueberries, with an intense blueberry flavor. Huckleberries are not cultivated commercially, so you will have to find them in the wild. The entire fruit is edible…no need to remove the seeds. Huckleberries can be used interchangeably in most blueberry recipes, so if you find yourself with a huckleberry harvest, just choose a blueberry recipe and give it a whirl. Huckleberry season is normally from June through August. To harvest a large quantity, spread a clean cloth on the ground and shake the plant; ripe fruits will drop onto the cloth. Store at temperatures just above freezing with high humidity. The Patch has over thirty thousand…that’s right 30,000 tomato plants. Fernando is the go to guy. There will be tomatoes through Thanksgiving. Tomatoes are at their peak now.